The original deep pressure self massage tool. 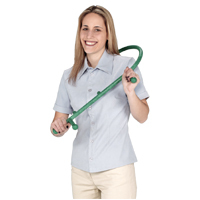 The Thera Cane® uses leverage to treat hard to reach areas, applying acupressure to reduce stress and relieve muscular tension. Comes with an owner's manual explaining proper use to treat the entire body. Re sale and bulk pricing - call us. Weight: 1 lb. Length: 24" Width: 15" Diameter: 1"
"The Thera Cane is a great product and I will continue to promote its use with my patients." "The Thera Cane is one of the best self-management tools I have been able to offer my patients." "Enclosed is a purchase order for more Thera Canes. The first one I purchased has been working out well."